Using ReSharper 8.2 on local computer and NUnit 2.6.3 on build server found there were some test which passed in ReSharper and failed in NUnit. Installed NUnit locally and same results so it is not a difference between computers. Two of my colleagues ran the same tests and had same results so doesn't seem something messing my computer. Expected string length 45 but was 44. Strings differ at index 35. Expected string length 87 but was 83. Strings differ at index 76. Does anyone knows what how to fix that? Is it a bug in ReSharper or NUnit? I think, in your case, ReSharper and NUnit just use different configs. Although, it is really strange, that NUnit received old uri escaping results for .NET 4.5. 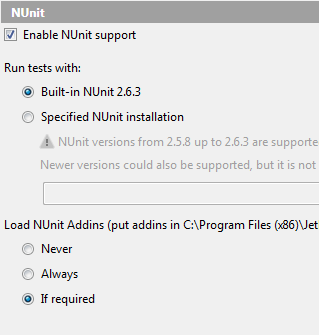 Maybe NUnit use some microsoft libraries from .NET 4.0. Also, you can fail the test in ReSharper by manual set the Framework option to CLR4.0. Anyway, you should rewrite tests with environment independent logic. Not the answer you're looking for? Browse other questions tagged c# .net unit-testing nunit resharper or ask your own question.